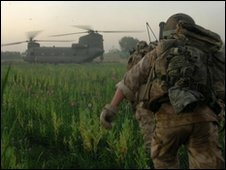 UK troops in Helmand are to come under the command of a US general as part of a major restructuring of Nato forces in Afghanistan due to be announced. UK forces currently take their orders from British Major General Nick Carter, in charge of operations in the south. But the region is to be split in two to make it more manageable. Gen Carter will oversee Kandahar and a US major general will command forces in Helmand. Most UK troops on Afghan operations are based in Helmand province. An announcement on the changes is expected within days. With the recent influx of American forces, there are now too many troops in too large a geographical area for just one command, making it unwieldy. Under the plans agreed between Nato members, Regional Command (RC) South will be divided into RC South-West and RC South (East). The new RC South-West will take in Helmand where both UK and US forces have been involved in Operation Moshtarak, which aims to clear Taliban forces from Marjah and Nad Ali, in Helmand. British Forces say they have made significant progress in Nad Ali over the past few months. That progress has been measured by fewer attacks from insurgents, and greater participation by locals in governing the region. US Marines in Southern Helmand have also moved into Marjah - though they are still meeting resistance. But the next big military objective is focused on Kandahar - in the new RC South (East). Kandahar has become the insurgents' stronghold, which is another reason to split the regional command. Nato says what happens in Kandahar over the coming months will be of critical significance to Afghanistan's future. Kandahar's problems are more acute - there is little governance, but plenty of corruption and crime. The immediate task for US troops, alongside Canadian forces, is to bring order to one of Afghanistan's most lawless provinces. Perhaps the surprise is that a British general will be in command of operations being conducted by US and Canadian troops, while an American general will take charge of British forces. While Gen Carter will continue to oversee operations in Kandahar, he will hand over control of Helmand to a US Marine - expected to be Maj Gen Richard Mills. For British troops the move will mean relatively little, for the moment. UK forces will remain in their current area of operation in Central Helmand, while all that changes is the man at the top. Some may interpret the move as the Americans taking over a so-called British sector - and the UK Ministry of Defence will be very anxious to avoid any headlines that suggest the Americans are having to bail out the British. But Professor Michael Clarke, director of the Royal United Services Institute, a think tank, said the split makes military and administrative sense. He noted that in many ways the bigger deal was that the Americans were willing for a British general to oversee their forces in Kandahar. But the move may signal bigger, and more significant changes ahead. There has been a debate among Nato commanders as to whether British troops should move to Kandahar when the Canadians leave. Canada has said it is pulling out its troops for good in the summer of 2011. Transferring British forces from Helmand to Kandahar would prove more controversial - a much tougher decision than changing the line of command. It raises the emotive question of sacrifice and cost - why would British troops hand over Helmand to the Americans when they have expended so much blood and treasure? In a recent interview on BBC Radio 4 the new Defence Secretary, Liam Fox, said that Nato countries should not be "precious" about where their forces are deployed. It was more important, he said, to ensure a nation's forces were placed where they would have the greatest effect. Gen Stanley McChrystal, the head of Isaf forces, has also said he is "nation-blind". But there are questions over whether that would be the view of the British soldiers and their families who have already sacrificed so much in the province.